We have a retail storefront at our warehouse. 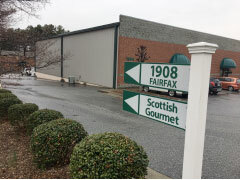 Our Store is located at 1908 Fairfax Road, Suite B, Greensboro, North Carolina. We are not in a fancy shopping area – we are Scottish after all and prefer low rents! So follow the signs down the driveway to 1908 Fairfax Road, which is behind 1904 Fairfax Road. Our Store is Handicapped Accessible and we have a large comfortable chair for shoppers. 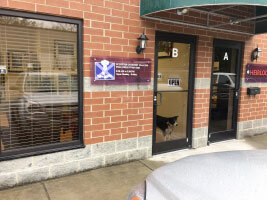 The official greeter is Flora, our Border Collie – she comes to the door whenever is opens. Buy online- Pick-up at store – use promocode PICKUP to remove shipping charges, and please tell us in the order message when you will be picking up the order. Visit us at our travelling store – We attend over 30 Scottish events across the USA each year. We bring the store to you! We love to meet our customers face to face – go to Scottish Games & Festivals to see all the events we are attending this year.